Living in a city or suburban environment these days, one is not compelled to interact with a neighbour, but in the country or bush it is expected the first thing you do when moving into the area is to introduce yourself to your close neighbours. Well, it’s taken me six years to meet my ‘phantom neighbour’, Bruce Wagner. Now Bruce is a born and bred Boonah bloke who has accumulated a couple of good properties, one of which butts into the property where I live. It is located in a mountainous region of the Scenic Rim in SE QLD and is covered in vast areas of regrowth, lantana, black wattle and porphyry rock boulders, but when tidied it exposes some beautiful rich black soil which, as we get some pretty handy rainfall, makes this an ideal cattle producing part of the country. To get the maximum value required to run his ever increasing cattle numbers Bruce has bought a very tidy Caterpillar D6R Series 3 Dozer with a tree pusher, stick rake and standard rippers to use in clearing and to keep on top of the never-ending battle of weed and regrowth control. Now Bruce and his sons have plenty of farm- or heavy-plant-related machinery, but to achieve the best outcome for his properties he needed something better and more modern than his little International BTD6 dozer which had faithfully served him for so long. Not wanting to be working under the bonnet repairing the machine everyday Bruce went in search of a used, low-hours, competitively priced D6R with specifications to suit his application up here on the mountain. 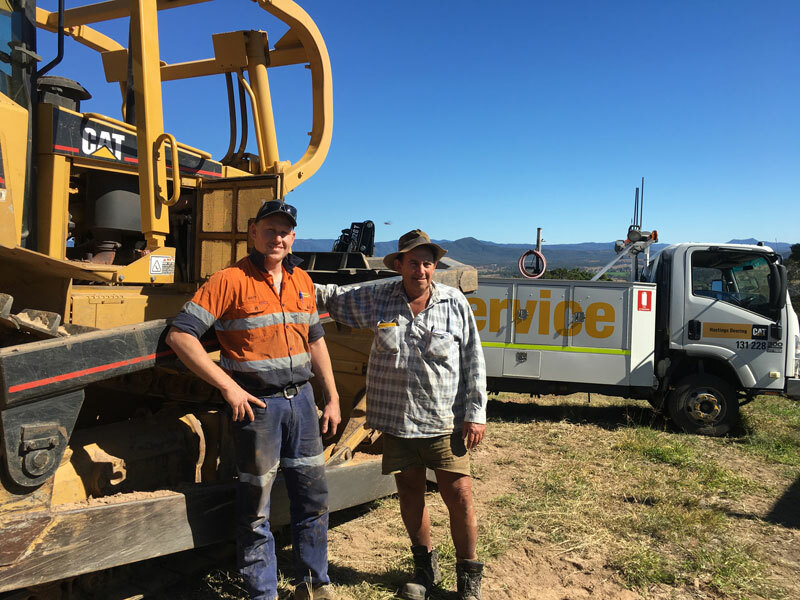 Finding one in Victoria, Bruce went about doing all the checks and balances and had a heavy machinery professional complete his appraisals before purchasing from a reputable heavy-machinery dealer. With all the boxes ticked (and items requiring attention noted) Bruce bought a tidy little 8000-hour Caterpillar D6R Series III dozer. Bruce’s son Kurt designed and manufactured both the stick rake and the ripper counterweight, while the tree pusher was fabricated out of Toowoomba. A new set of track gear was added and presto, the D6R was up and running ─ well for the first eight hours at least! Unbeknown to Bruce and the appraiser, the final drive motors had previously encountered issues and had non-genuine bearings replaced and bastardised before being painted, detailed and hastily put on the market for sale. 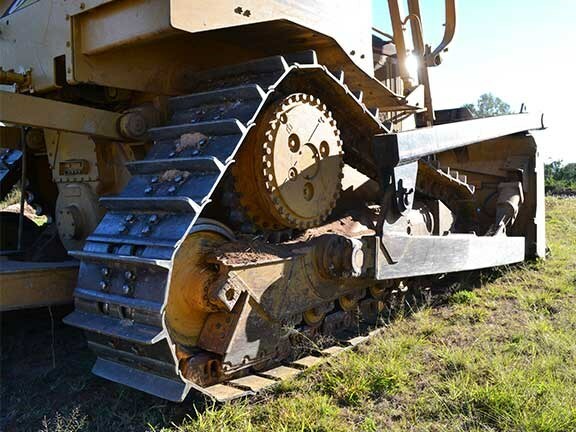 Even after completing all the pre-purchase assessments on the machine, Bruce was now faced with a substantial cost in getting the Cat D6 operational and he basically had not turned a wheel (or track). 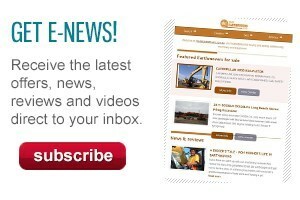 These are just some of the issues facing the buyer of used machinery who, after checking everything possible, discovers there are unscrupulous people in the industry who can mask serious faults prior to sale. Bruce engaged Hastings Deering from Brisbane to service and execute the repairs, and in doing so has built up an excellent owner/dealer/service relationship. The end result is that Bruce now has a very tidy, modern and reliable D6R Series III dozer. The presentation of the D6R is exceptional and faultless. As the little Cat crawled its way along the road and into the testing grounds, it was quite apparent that Bruce has pride in his gear and, as I was to later find out, pride in his work. 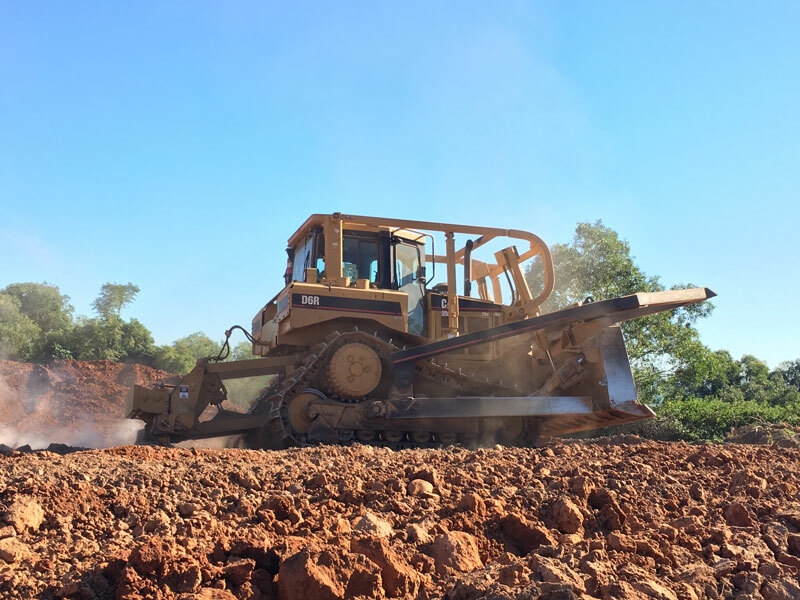 The area in which we tested the dozer was not going to be easy to tackle – decomposed bedrock material on which I had already run a 28-day soak and compaction test. It was suitable for some reasonable road-base material for our internal roads and, in winning the material, I hoped we could gouge out an area of some 2000 square metres capable of holding water for future use. 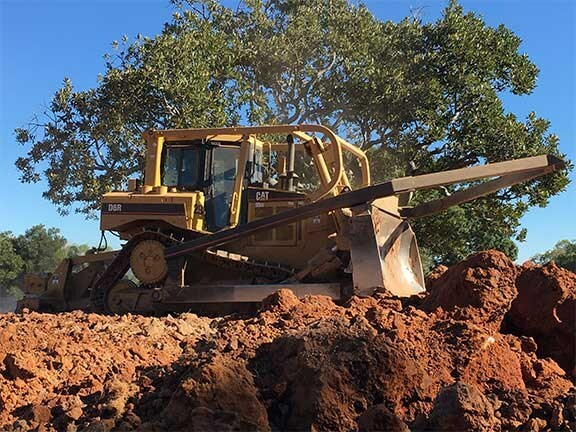 The D6 is a well-balanced machine and perfectly suited to a contractor like Bruce. The tree pusher was still fitted but as we had no trees to push or to rake it looked a bit of overkill for our needs. 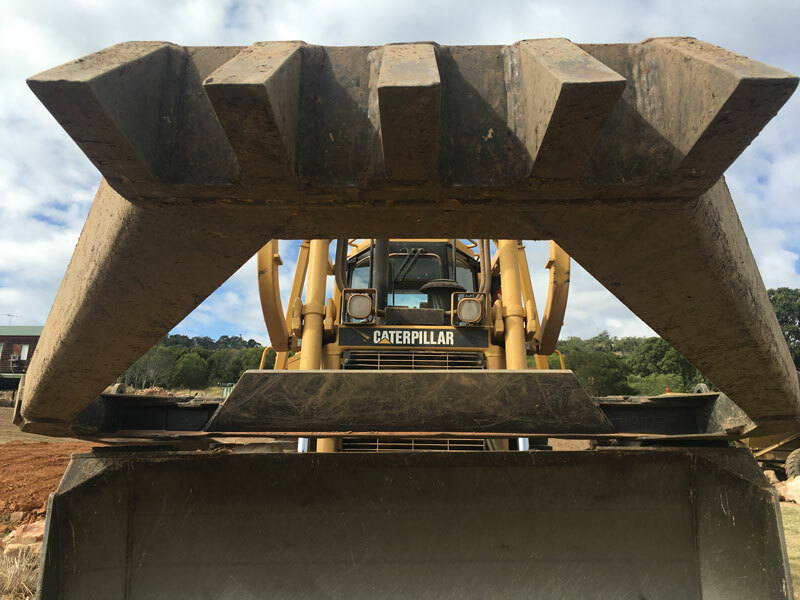 The machine was standard fitted with Cat-designed parallelogram multi-shank curved rippers capable of housing three shanks, but we figured two were more beneficial on this job due to the tight ground conditions. 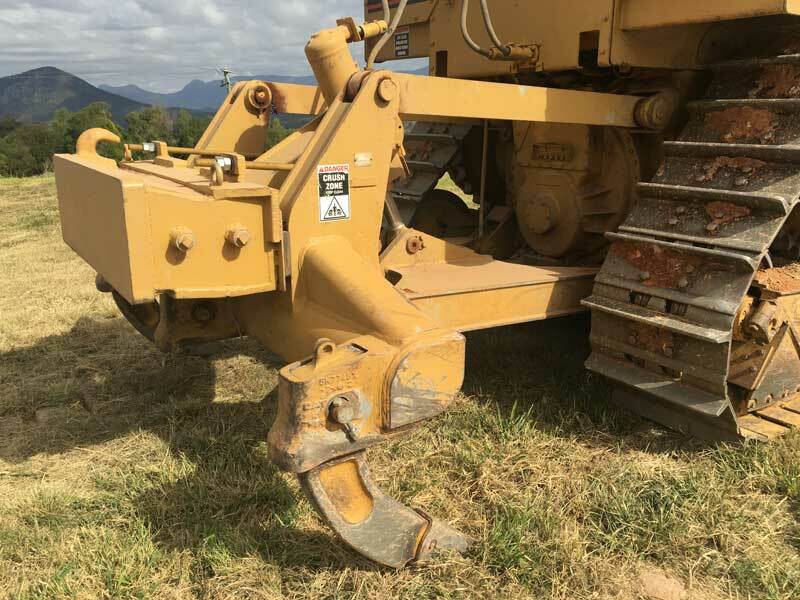 A home-made Wagner-designed ripper counterweight was fitted to give the dozer a bit more weight over the back end (and proved warranted) as it balanced out the tree pusher just nicely. The FOPS cabin, protective frame and new track gear housing the elevated drive motors stuck out like a beacon in a fog and complemented the overall appearance of this very tidy machine. 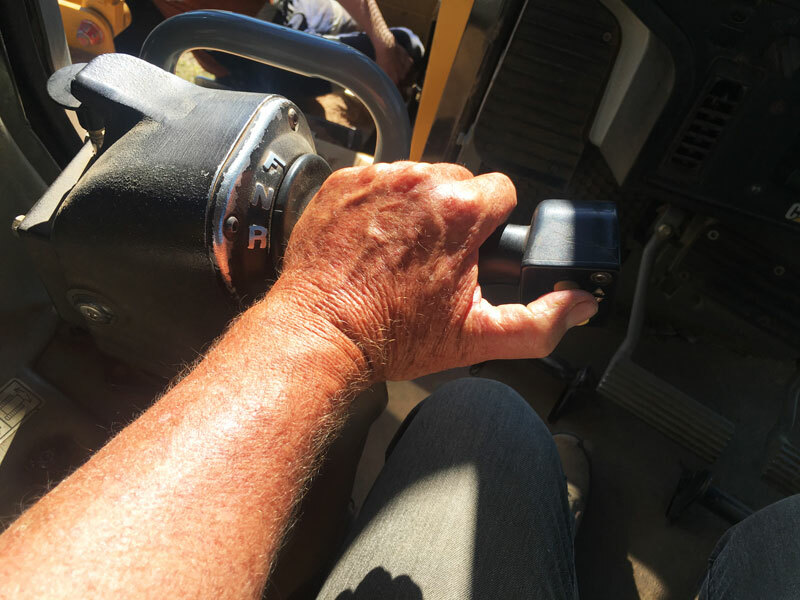 As with all Cat gear the cabin is standard but fitted out more than adequately for blokes like me and Bruce (both ageing old-school fellas doing it tough at the end of any day), and has the easy-to-identify gauges of relevance smack bang in front of you. The tapered hood, notched fuel tank and narrow single-shank ripper carriage give the operator a clear line of sight to the front and rear work areas. The large single-pane windows offer excellent viewing to the sides and blade. The low rear window lets the operator see the ripper tip, and the 30-degree-offset operator’s seat allows perfect forward and rear vision without compromising your neck. Differential steering controls the direction and degree of turns, forward/reverse shifting and gear selection in a single control handle enhancing operator comfort. Touch buttons on the steering control operate the electronically controlled power-shift transmission. The Cat runs a tried and true 8.8-litre Cat C9 ACERT turbo-diesel engine, developing a healthy 159kW (213hp) and has a 450-litre fuel tank and a 51.5-litre hydraulic tank. I love the ‘underhood service light’ which makes the prestart checks on night shift so darn easy and, of course, any after-dayshift repairs or servicing easier to execute. The D6R’s major components are modular in design and most can be removed without disturbing or removing others. 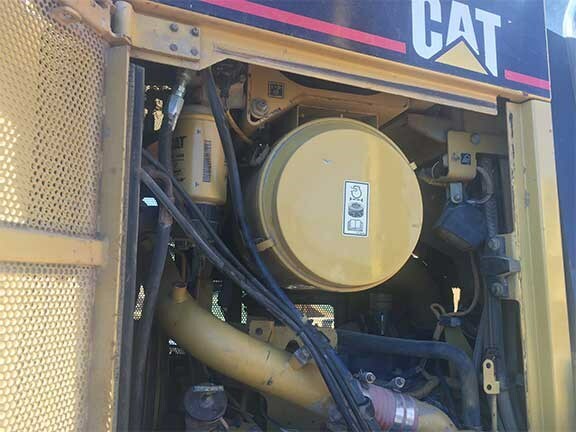 The D6R also has the inbuilt serviceability of the flexible Caterpillar Monitoring System which can be upgraded as technology changes and new electronics and programs become available. We realised how easy servicing was when the D6R’s service fell due while working on the job; the mobile serviceman from Hasting Deering was prompt and efficient and had the machine back in action in no time. As I said before, the task we had in mind was not going to be an easy one for the little D6. A touch too small for the works on hand, a touch too light in the rear end where a set of quad rippers would have made a lot of difference in this application, but, to its credit and Bruce’s operating ability, the D6R Series III came through the ordeal with flying colours and achieved a truly remarkable outcome. 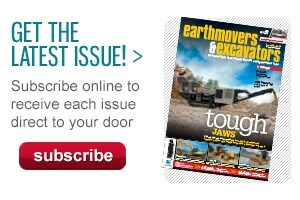 The difference between a big and small machine working in this type of environment is time and money. The bigger the machine, the more dollars per hour but less time on the job … a smaller machine is less in dollars per hour but more time on the job. We were able to produce about 1500 tonnes of road base (which equates to almost $40,000 value in this region), another 1000 tonnes of topsoil and loam, and left us with a tidy 2000-square-metre hole just ready to be converted into landscaped water storage. This rock was tighter than a fish’s bum; we had already tried in vain to rip it with an excavator and had had some success in hammering it with a rock breaker, but this was costly and non-productive over such a large area. 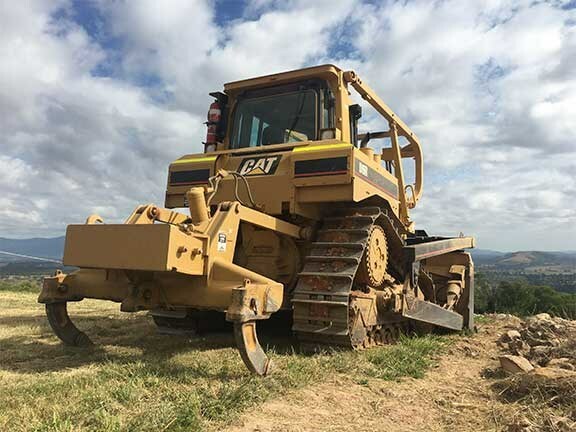 This size Cat dozer is a great all-round size and performer, very capable of performing some of the larger, more difficult jobs but perfect for trimming and general earthworks. I learned a few things over the test period, one of them being that I have a lot in common with my great neighbour Bruce Wagner. We have a passion for heavy machinery, its capabilities and performance parameters. I also learned that Hastings Deering’s spare parts section is open seven days a week and 24 hours a day for any customer to access those parts required to keep us all on the move. I also met a couple of excellent, knowledgeable, polite and professional fitters from Hastings Deering in Matt Diflo and Mitch Mulholland, both whom love their job, their company and the equipment they work with. It is days like this that gives us old blokes a warm and fuzzy feeling that our beloved industry is being handed over to a new generation of good young blokes like these … and that in itself is worthy of a story any day. 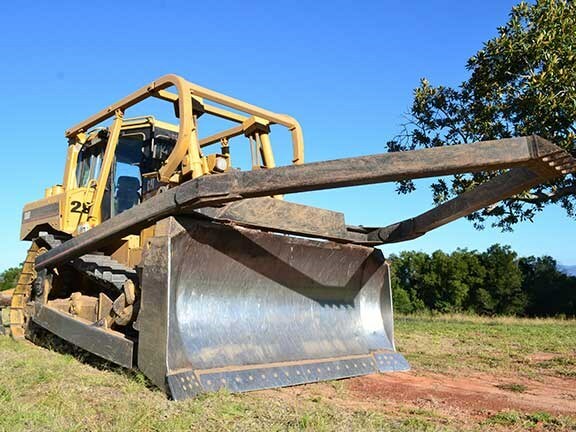 Ron Horner falls in love with a Cat D8R Series II dozer with stick rake and tree pusher.